FOLKLORE FESTIVAL : A SUCCESSFUL LAUNCHING. The Bolivian group, coming from La Paz, met with its usual success. Pipe flutes, mandolines and percussions captivated the public, always blighted to hear musics from Brasil, Peru or Argentina played on Bolivian instruments. The effects of South American magic have thus, once again, been felt. MORE THAN 3000 PEOPLE AT THE ENCLOS FOLKLORIC FESTIVAL. 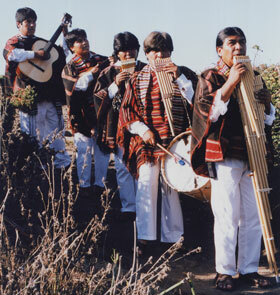 Fed by the Bolivian group LLAPAKU whose traditional and folkloric repertoire won over the public. In the evening, during the FEST-NOZ, the four high-plateau musicians surprised every body when they joined the local organizers in two Breton songs. They will certaily be one day or another in Guimiliau. This week, they will be in Morlaix for the Street Arts. SHOOTING DAY : 2000 SPECTATORS AND...A ROUND OF APPLAUSE FOR THE BOLIVIANS ! Fortunately, the Bolivians were there, with their energy and enthusiasm ! Even thouger they were scheduled for 8 : 30 P.M., they bindly agreed to Stand in for the failing bagad, on the spot. The group LLAPAKU is only made up of four musicians, but four experienced musicians, which allows them to interpret the most varied rythms belonging to the traditional and folkloric repertoire of the Andes, as well as personal compositions always based on traditional gronnds. And they played, sang, made us discover this cultural and musical patrimony with such joy that the public happly participated in their music. The spectators particular by appreciated that. Despite the rain, they Stayed, applauding till late, this high-quality concert which helped them forget a little-so do we hope-the beginning of the evening. LLLAPAKU, a group of four dressed up Bolivian musicians with South American instruments will be on stage, next Sunday at the fair, to give the best of traditional Andean folklore. Elisabeth Pellicot and her association "Art clé en main" proposed this group. The colorful ensemble with its traditional music backed up by the famous Andean flute will introduce us to one of the oldest and richest South American civilizations. 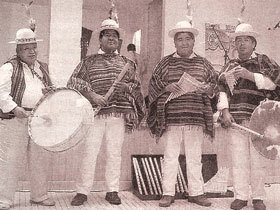 The four musicians of the group Llapaku have been for ten or so years the ambassadors of the traditional music of Andean countries : Bolivia, Peru, Ecuador. During their show, they allow the audience to be familiar with the different rhythms and instruments of those regions. But the group doesn’t confine itself to ancient songs; it also offers some personal compositions. A mixture of tradition and modernity, their music is the occasion of searching new sounds with the Andean stringed and wind instruments, as well as Andean drums. The group named itself after a mysterious and benevolent being, a messenger of the earth and the stars, which appears on the High Plateaus to predict the crops. Through its songs, the group tells the life of the high Plateaus, the valleys and the tropical regions of the Andean countries, traveling among the traditional legacies and the evolution of today’s world. 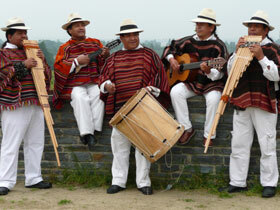 The group Llapaku, named after a mystical being of the Andean culture, is a brilliant demonstration of it. It is indeed an array of flutes and panpipes which compose the musical material of the group, from the smallest to the biggest, producing neat and high sounds as well as low whispers – almost reaching a no-sound level. Those are the produce of the flutes’ forms but also of the flautist’s talent in blowing them. The rhythms also are varied. From the nostalgia of the first songs to vibrating accents at the end of the concert. A nice evening with a taste of South America with the group Llapaku. Last Saturday evening in La Chaumière du Théven, we had a nice time. The team of Michel Masson, president of the organization Chom Bepred, was satisfied with this unusual evening. It had started with a diner on the spot, in order to be in the mood. With tasty bacon slices as a basis, the menu was very much appreciated. Around 10PM, the renowned Bolivian group went on the stage built especially for the occasion. The five musicians of the group have been, for the last decade, the ambassadors of the traditional music of the countries of the Andes : Bolivia, Peru, Ecuador. Their show thus gave us a taste of the various rhythms and instruments of those regions. 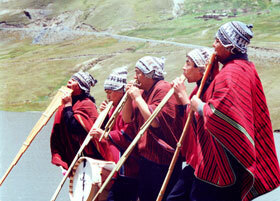 The group Llapaku, named after a mystical being of the Andean culture, is an array of flutes and pan pipes. The wind instruments accompanied with drums (bombo, wankara, chaj’chas) were delightful to our ears. The varied rhythms, from the nostalgia of the first songs to the pulsating accents of the end the concert, produced a musical atmosphere that led the audience to the Bolivian high plateaus, 4.000 m. high, and that helped us know a bit more the soul of the Indians of those far-away shores. One could say they day-dreamed with musicians in round hats and colorful ponchos. The organization Chom Bepred made a nice choice. On Saturday 25 August Llapaku has introduced the traditional music from the Andes for the last concert of the summer at la Barre-de-Monts, place de la gare in Fromentine. This first visit of this band in Vendée has been cheered by about 800 personns. Llapaku, which is from Bolivia and has now settles in Rennes, and which hold his name from the mystical and good will character who predicts the harvest's quality in the high-plateaux, existed since 1991. 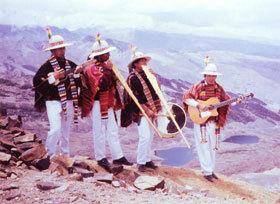 The Five musicians rather play traditional music from the Andes. “When other groups are evolving to modern music , Llapaku wants to preserve the accoustic andean music and the indian culture to have them lasted. The musician German Tintaya explains. 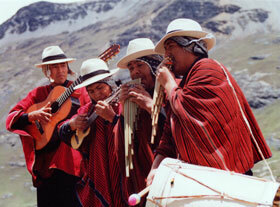 Songwriters, they present the many-sided music from the Andes . Always seeking for the pure sounds of the instruments, the sono only contributes to amplify. The whole of their music is a great combination of strings, winds and percussion instruments, and are personnal creations based on traditionnal rythms. They have a variety of influences. They present to the the audience an outline of the different rythms which characterized the regions Of Bolivia and Equator. The string instruments (Guitar and Charango which was formerly made out of an Armadillo's shell) combine themselves to wind instruments (several panpipes flutes whose pipes can be as long as 1,5 meter) and percussion instruments (The Bombo ,among others, which is covered with goat or sheep skin)The Summer Festival of Nantes in 1997 called “ the American paths” had a all importance for Llapaku for it represents a great opening in other festivals they are now called upon, mostly in Bretagne. A first tape has been recorded in 1991, since then four CDs have followed, to diffuse pure melodies from 4000m of height. It’s a pure delight, a perfect mixture of wild rythms and spicy tunes. The repertoire, made of their own compostitions, is the expression of the traditional rythmic heritage, referring to certain regions and even to some festive events. The panpipe lovers were overcome by the pleasure it brought them. The audience applauded again and again, and they were enthusiastic for those five nice musicians. For two hours, the Llapakus, whose name comes from a mystical being presiding over the cycle of seasons and crops, interpreted some twenty or so tunes containing “the strength and the energy of the Andes”. The five artists, who can play various instruments, alternated between joyful and nostalgic tunes. The audience, moved by the rhythm of Andean musics, weren’t impassive, and some of them couldn’t help dancing on their seats. A bolivian Music concert, a representation for a fair cause. Melanie Porte, the chairwoman of the very young humanitarian association called « Sourires Bolivianos » created in January 2006, organized a Bolivian music concert in the hall Artois. This evening representation aimed at raising funds for the Kuskachakuna fondation. The six members of this association have managed their first concert by inviting the group « Llapaku » from Rennes. 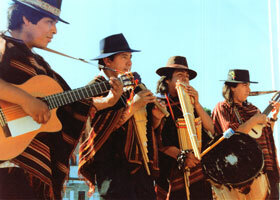 Music from Bolivia, Peru and from Equator have been proposed but also some songs sung in Quechua and in Aymara. The instruments are made by the musicians themselves out of Bamboo. As long as the concert has lasted, we felt ourselves entirely abroad and the music was appeasing. 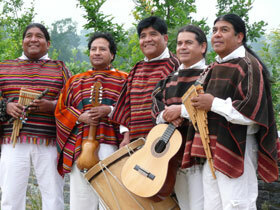 Llapaku move all over France in order to have the Andean music discover. 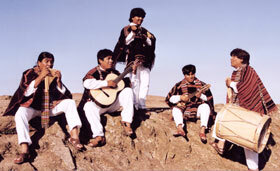 Five men from Bolivia, both musicians and singers, make up the band LLAPAKU. Since 2004, they’ve decided to stay in France to have a better chance at spreading the traditional music and songs of their country. Their approach goes even further since they interpret with deep intensity tunes of the well-furnished Andean repertoire, and personal composition to promote Andean culture. Three flutes, two string instruments and some drums that will help you discover this cultural patrimony. The Tintaya brothers (German, Nestor, Cristian), Miguel Osorio and Abel Caceres bring us along to the heart of one of the most ancient civilizations, to the sound of the sikus, the quenas, the charango and bandolin, accompanied by the rhythm of the bombos and the chajchas. A travel through the Andean High Plateaux with their gigantic landscapes, and the colorful markets with their shimmering wool work, their Lamas and Alpacas. The energy, the shining colors, the talent of the band Llapaku can, only make the audience enthusiastic to participate in this wonderful musical voyage to the discovery of the Andes.